← Hold the Bread & Chicken? Too Much Sodium, Really!? Standing in the aisle of the grocery store looking at all the brands of cereal with a puzzled look on your face. Phrase flash before your eyes “whole grain, high fiber, low sugar, smart choice, organic, good source of fiber…” Ahhhh what does this all mean!?! It means turn that package over! The nutrition fact label is where the truth will lie. However even nutrition fact label can sometimes be puzzling. I picked up a simple solutions from a colleague of mine, Dr. Altman. I have dubbed it the “Altman Rule“. 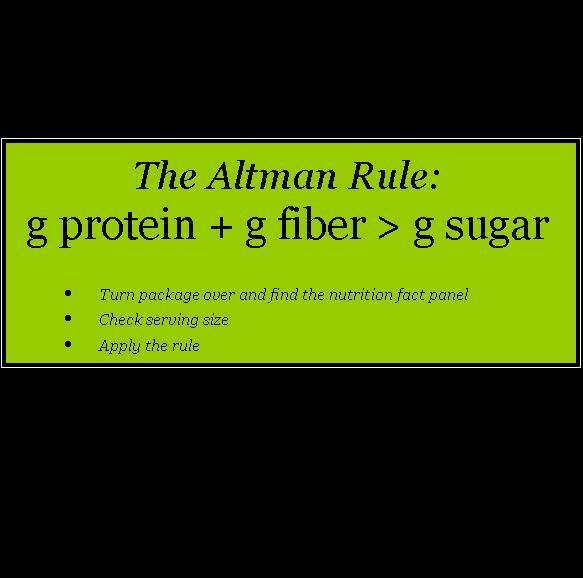 The Altman Rule is a cleaver trick to simplify label reading when it come to sugar, protein and fiber. (1) Located the grams of sugar, protein and fiber on the food label. Also be sure to check the serving size. (2) Add the grams of protein with the grams of fiber. 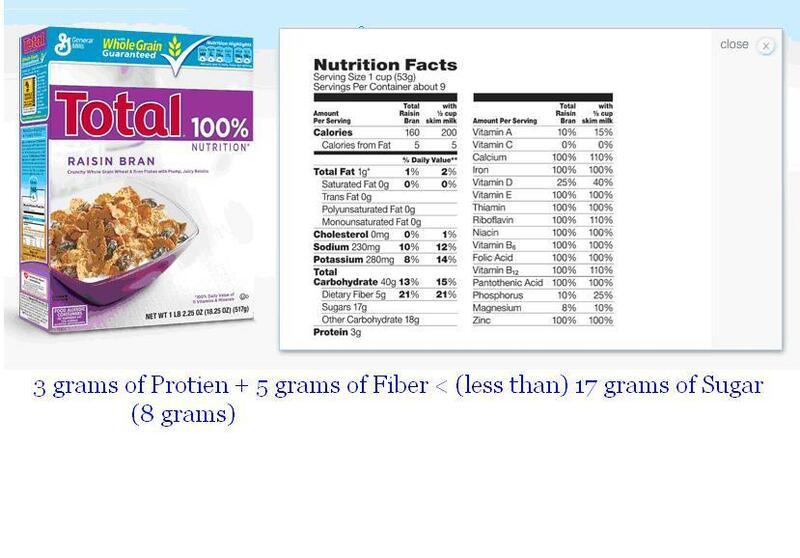 (3) Compare the grams of protein + grams of fiber total, to the total grams of sugar. (4) If the grams of protein + grams of fiber total is greater than (>) total grams of sugar than the product is a good choice, if is it is less than (<) it is not the best choice. It is a brilliant rule because it tells you if there is more “good” stuff (fiber/protein) in a product compared to “bad” stuff (sugar). If there is more fiber and protein in a product than sugar it will likely keep you full longer and be a lower glycemic index choice. This rule can be applied to most packaged foods, cereals, breads, cracker, yogurts etc. Here are two examples of cereals that many of my clients tend to include in their diet and based on the name brands, and packaging one would perceive as healthy. But you will see not all cereals are created equal. Total Cereal does a great job with advertising whole grains on their package and most consumers would look at this cereal and say great choice. Based on fiber alone, having 5 grams per 1 cup serving, it is! However what most of us might overlook on this cereal is the 17 grams of sugar per 1 cup serving. There is more sugar in this product than fiber and protein combined. Based on the Altman Rule this may not always be your best choice. Kashi brand cereals can really vary when it comes to this rule. 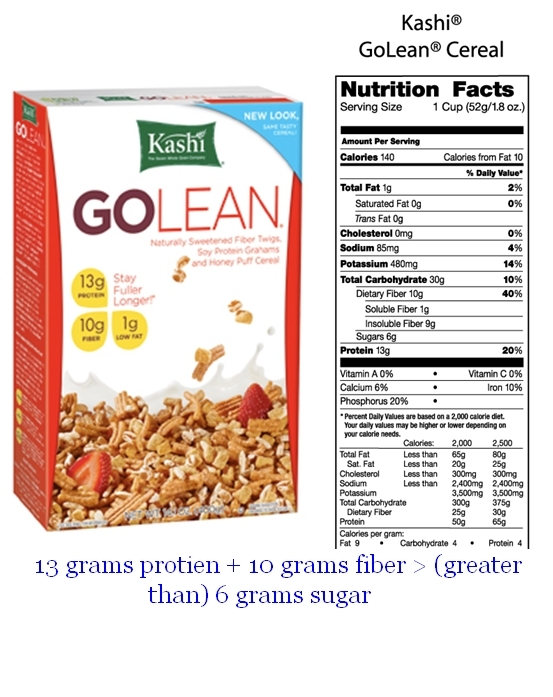 The Go Lean Cereal below happens to do well when you apply the Altman Rule, however some of the Go Lean Crunch cereal have a surprising large amounts of added sugar. My challenge for you this week is to turn that package over and start to look at that nutrition label. Stop trusting the phrases on the front of the package and use the Altman Rule to help you make your own smart choices! This entry was posted in Food Label, Snacking, Uncategorized and tagged food choices, Food label, High Fiber, Snacking, Sugar, Weight loss. Bookmark the permalink.